This question is about designing. Design Theme: Promoting Firework Safety for Children. Read the Design Brief and Design Specification below. A Fireworks Safety website, sponsored by the Government, wants to promote a safety leaflet, which is aimed at children and adults. The leaflet is free and will be distributed at supermarkets and retailers. The manager of the ‘Fireworks Safety Website’, wants you to design a leaflet holder / display unit, that will store at least ten leaflets. be decorated with appropriate graphics / images and a title, that will promote firework safety. Please note, you can add to / edit the basic shape and form of the leaflet holder / display, seen below. The basic design of the display unit is shown above. Develop the design, so that it is more interesting and eye catching. 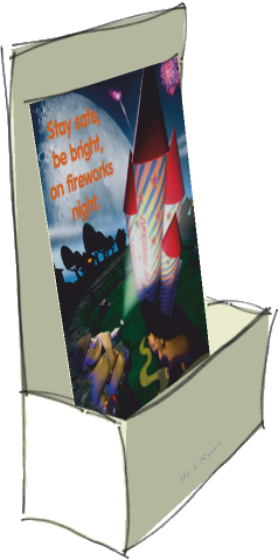 Add images / colour and graphics, ensuring that the message ‘Firework Safety for Children’ is emphasised. It should be possible to send the leaflet holder / display unit through the post. It can then be folded into shape and glued permanently. You can edit and add to, the design above. 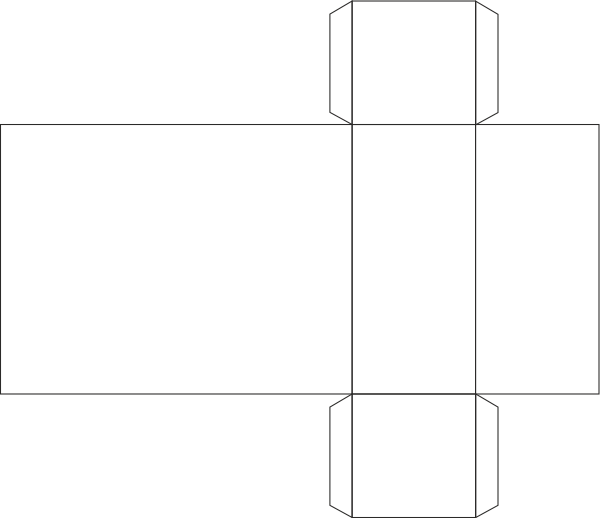 However, the basic shape/form must stay the same. The leaflet opposite is from the ‘UK Fireworks Safety Website’. 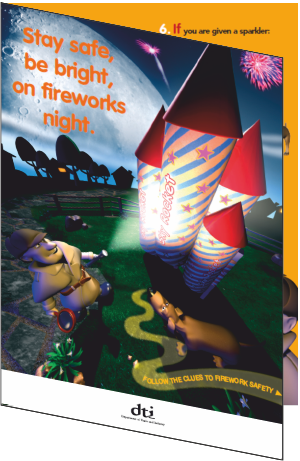 The leaflet promotes the safe use of fireworks. It is A4 glossy (lacquered) paper, folded in half. Design a leaflet holder / display unit to hold at least ten leaflets. It will stand on a surface top next to the till / check out of a supermarket. The basic design is shown below, in the form of a net / development.